Looking for a unique getaway with the girls? Skip the resort retreat and pack your suitcase for a Carnival Cruise - just don’t forget your swimsuit! After flying in to Los Angeles from Vancouver, Canada we were ready to trade in our rainboots for bathing suits and a long weekend of fun in the sun on Carnival’s 3 day cruise to Ensenada, Mexico! We boarded the Carnival Imagination at Long Beach and set out to sea for a few days of relaxing, adventuring, and wine tasting. When we arrived in Ensenada, there were a lot of excursions to choose from, like horseback riding and wine tasting! We started off exploring the town of Ensenada, because we will jump at any chance to enjoy fish tacos, margaritas, and churros. If you’re looking for hip Mexico, there is a cool plaza that is home to a local coffee shop, a vegan bakery, and there’s even a tasting room for the oldest winery in Baja. You can also wander through Ensenada until you get to Hussong’s Cantina, which claims to have invented the margarita! Did you know that Mexico has a wine country, and that it's only about 30 minutes from Ensenada? It’s super close to San Diego too, and we love visiting Valle de Guadalupe any chance we get! You’re given about 8 hours on the cruise to explore Ensenada, which is a lot of time but you also have to prioritize what you want to do! We definitely recommend heading to Mexico’s wine country, whether you book a wine tasting excursion with Carnival (hello, convenience) or do it yourself via a personal driver. Cuatro Cuatros is one of the best views of the Baja coast! Summer is definitely the time to visit wine country, but there’s still a lot to see in the off season too! We always love a visit to Encuentro Guadalupe, the tasting room is part of an "eco-hotel" that has modern yurt-like rooms nestled along a hill, overlooking the rolling greenery of the valley. Not pictured? The infinity pool behind it all. We love the bright and modern tasting room, and the view is stellar. There's a variety of wines available, so grab a bottle with friends and enjoy the Mexican sunshine in Valle de Guadalupe! Overall, we had such a fun trip on the cruise! 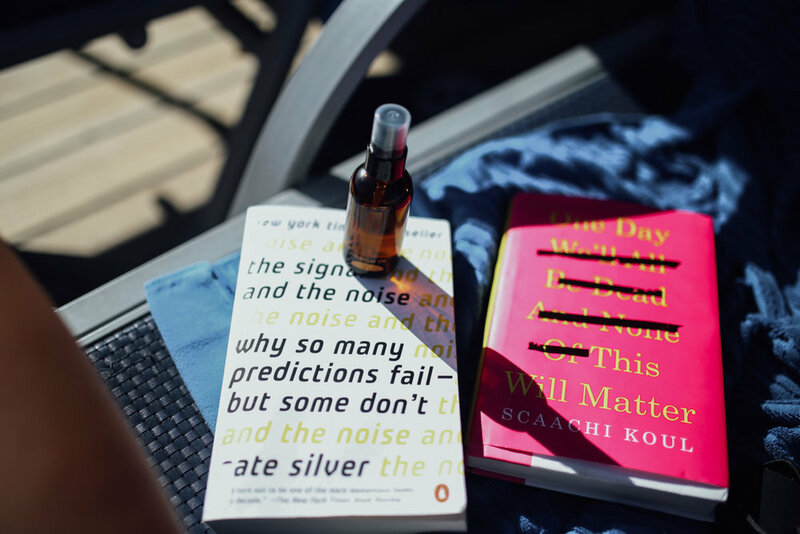 We seriously enjoyed lounging on the sundeck with a good book, so make sure you visit the cruise library! We picked up some awesome books to read, for free, and left some that we had finished. There’s also a spa on the ship, so you can indulge in a mani/pedi or a massage, which is the perfect activity for your day at sea. We also loved our nights on the cruise, we decided to go for dinner every night and loved getting to know our servers and enjoy yummy food and wine. We were surprised at how amazing the shows were too! They were definitely a highlight of the cruise for us. Honestly, we can’t say enough about soaking in the warm sunshine on a cruise ship! The cruise is super affordable, starting at around $220 per person, which includes all your meals and dining in the restaurant. We also opted for the Cheers beverage package, which gives you unlimited booze for a fixed price. Hard to not have a good time with pina coladas by the pool, right?